"Gun of the Week: Ruger .22 automatics"
This week's Gun of the Week is not one gun but rather a family of them, about which we have heard before: the long-running line of .22 rimfire semiautomatic pistols from Sturm, Ruger & Company. 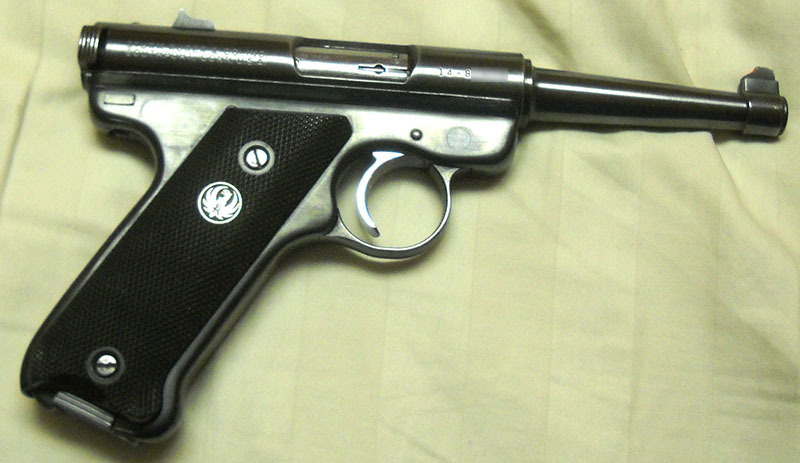 Pictured above is a Ruger Standard pistol, retroactively redubbed the Mark I after the company launched the improved Mark II version in 1982. The Standard was available in several configurations, of which the one shown above was the original flavor, in blued steel with a 4-inch barrel. 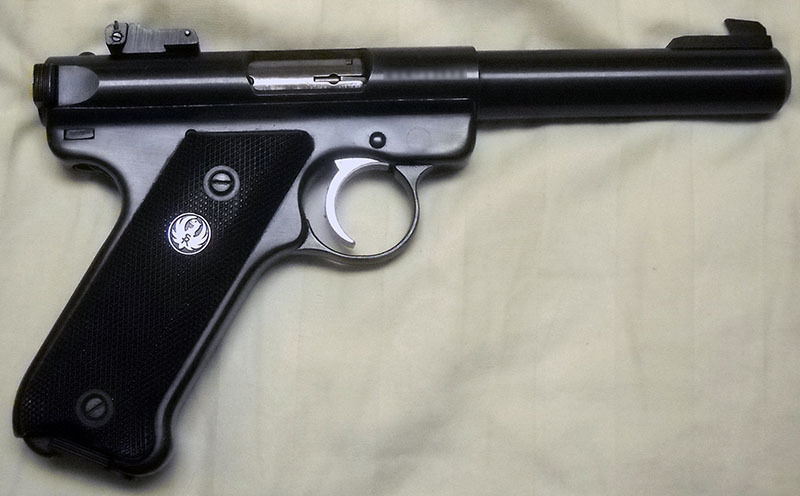 When I was taught to shoot by my grandfather in the early '80s, round about the same time the Mk II was coming onto the market, a Ruger Standard very like the one shown above was one of the three handguns he owned, and so was my first introduction to semiautomatic handgun shooting. One thing I should note right off the bat is that, despite the mostly coincidental resemblance of both the gun and the name, this firearm has nothing to do with the famous Luger pistol of Germany. Let's start with the name, which is entirely coincidental. A Luger is called a Luger because it was designed and patented by a man named Georg von Luger (1849-1923), an Austrian-born firearms designer who spent most of his career in Germany. He developed what was officially known as the Parabellum pistol out of the earlier Borchardt pistol, developed by Hugo Borchardt. (This is probably information best elaborated on in another post.) The Ruger, on the other hand, is the work of American inventor William B. "Bill" Ruger (1916-2002). Again, this gun and its history deserve to be their own Gun of the Week entry sometime, for for our purposes, what's most important is that the Luger is a toggle-action pistol; that is, the action functions not with a slide or linear bolt like most conventional semiautomatics, but rather by a mechanical linkage with a joint in the middle of it, which pulls the bolt back in the process of folding upward. The Ruger family of semiautomatics functions in a more conventional way, with a bolt enclosed in the cylindrical rear part of the receiver. Because it fires the low-pressure .22 LR rimfire cartridge, it can operate in a simple straight-blowback manner; it doesn't need anything as elaborate as a Luger's toggle lock. Apart from the grip angle and general shape, they're not very similar at all. However, sharp-eyed Gun of the Week habitués may already have noticed that there is also a distinct similarity to another notable pre-1940s firearm, one which we have seen before. I mentioned in a previous post that the Browning Hi-Power was kind of a signpost marking the transition between the age of the Lone Gunsmith and the more collaborative modern "company research" style of firearms development. The Ruger Standard is an exception. As far as is known—and I admit, the Ruger company kind of has a vested interest in promoting this as part of its corporate folklore, but it seems to be the consensus across all accounts I've seen—Bill Ruger developed the Standard on his own, in the old-fashioned "man in his garage" style that used to be the way all firearms design got done. 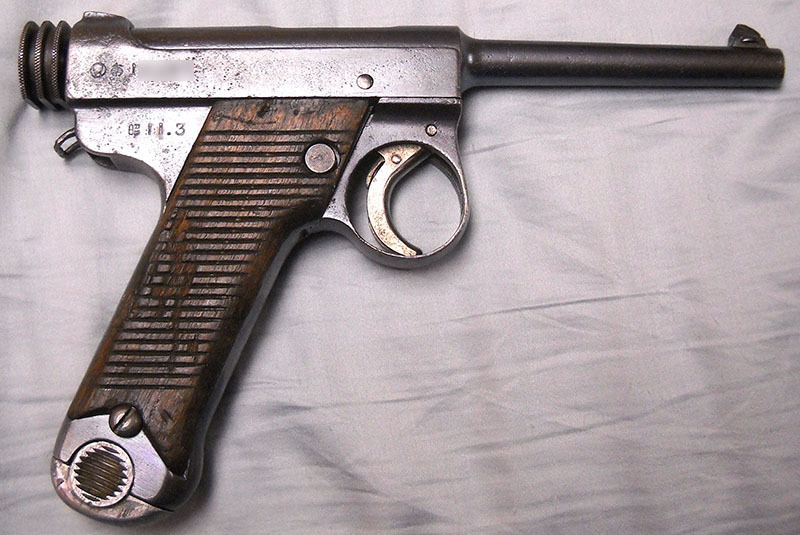 ... was copy a Nambu. Well, sort of. 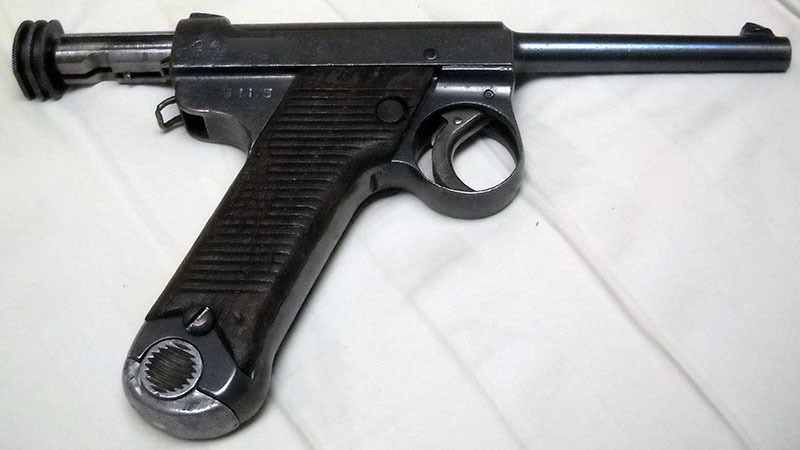 He actually had copied a Nambu by that point, albeit not the Type 14 shown; what he was working with was actually a pair of Baby Nambus (the smaller 7.65mm version sold to Japanese officers) brought back by someone from the Pacific Theater after World War II. 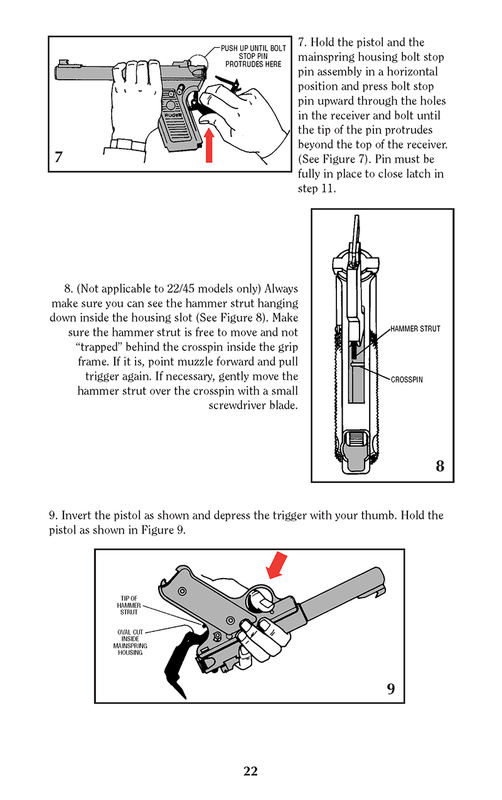 In the process of developing that copy, with an eye toward marketing it in the US (since the original patents had expired, and postwar Japan was not exactly in a position to be enforcing its patent laws on American inventors anyway), he kept fiddling with the design and tweaking things about it, and before he was finished he had developed an almost entirely new firearm, one based on a smaller, less demanding cartridge and mechanically simpler overall. By 1949, so the story goes, he had a completed prototype for what we now know as the Standard, and he showed it to his friend Alex Sturm, who was not an inventor but did know a thing or two about money. Sturm was impressed, and the two formed a partnership to manufacture and market Ruger's .22 pistol, which is why the company is called Sturm, Ruger and Company. Sturm was also apparently a keen student of heraldry: he designed the company logo, a crest featuring a stylized red eagle that looks, to the modern eye, rather eerily like the symbol of the Rebel Alliance. Sturm unexpectedly died in 1951 at the age of 28, before things really took off for Sturm, Ruger and Company; but evidently his financial policies were sound, because in his absence the company and its reasonably priced, well-made product rapidly became and remained successful. Contrary to the usual stereotype of relations between the second-billed engineer and his company's top-billed money man, Ruger seems to have been fond of Sturm and upset by his loss, because he immediately changed the logo, as it appeared on the medallions affixed to the product, from red to mourning black, and it stayed that way for decades. 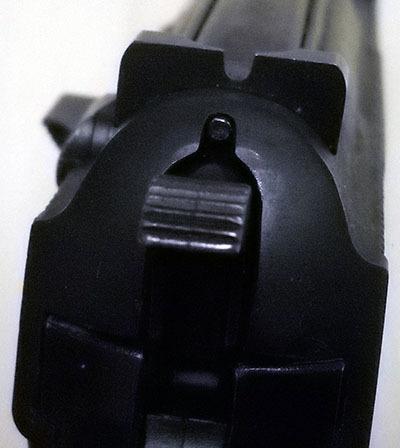 Over the three decades it was in production, the Mk I became available in a wide range of configurations: it could be had with a number of different-length barrels, with fixed or adjustable sights, with special adjustable target triggers, and just before production ended, a short run were made in stanless steel. In 1982, Ruger replaced the Standard with the Mk II, which was externally identical and available in the same range of configurations, plus the addition of stainless steel as a regular finish choice (where only a few stainless Mk Is were made as a limited edition). Magazine capacity increased from 9 rounds to 10 (although thanks to an engineering change made when the dies were replaced in 1971, Mk II magazines work fine in Mk I pistols made after that change), and they added an automatic bolt stop so it would stay open after the last round. 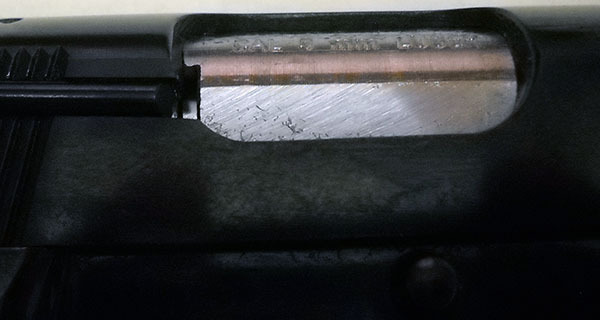 Unlike the Nambu, it doesn't slam shut again as soon as you pull the empty magazine, so you can load a fresh one and then drop the bolt to charge the chamber, as in most modern semiautos. The one I've got is a target model, which features a heavy 5.5-inch "bull barrel" and the more elaborate adjustable sights. The Ruger has a side ejection port as opposed to ejecting out of the top like its Japanese "uncle", but you will not find many other pistols with that cylindrical bolt thing going on. 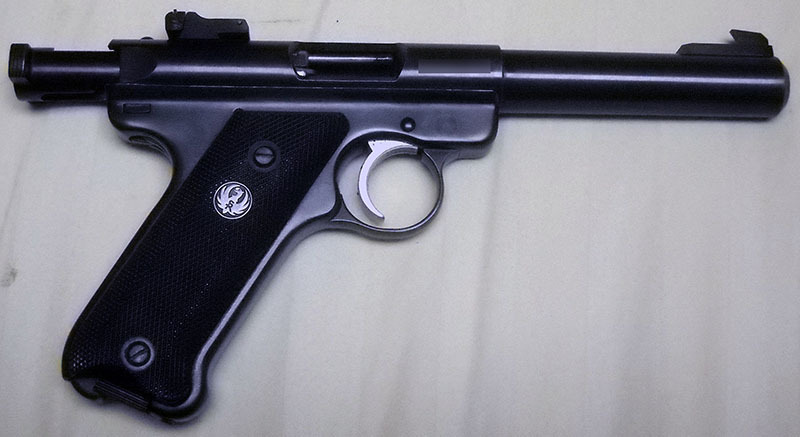 Another difference is that the Baby Nambu has a side-mounted magazine release button, whereas in his final design, Ruger went with an older-fashioned heel release. Heel-release magazines can be a hassle, but the catch on Rugers is nice and big, and has operated without a problem on all the various ones I've used over the years. Comparing the Mk I Standard and Mk II Targets, we can see that their frames are visually identical (in fact, this particular Mk I was made after 1971, so they're mechanically pretty much identical too). From above, the difference in the sights becomes obvious. The Target model's are larger and fancier. In my experience, though, there's nothing wrong with the accuracy of the non-target versions; they're just less adaptable to changing conditions on the range (which is not an issue if you're, say, indoors). Unsurprisingly, the markings on the side of the Mk I say nothing about "Mk I", since it was only dubbed that retroactive to the introduction of the Mk II. The Mk II, on the other hand, proudly states its iterated status. Unlike single-shot .22s like the Hawes Favorite mentioned in a previous article, Ruger automatics only work with .22 Long Rifle cartridges. This is an artifact of their semiauto operating systems; the earlier, shorter .22 cartridges don't generate enough pressure to operate the action, and they're the wrong length to fit in the magazine. You could probably load a .22 Long or .22 Short cartridge manually, fire it, and then extract it manually, but why would you want to? Ruger have long made a point of touting the safety of their products, and of promoting a safety culture in the shooters of those products—since long before it was "cool" to do so, as it happens. 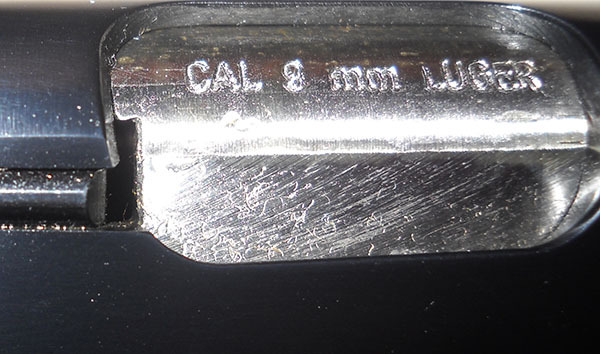 The barrel inscription on my Mk II is typical of the breed. They mean it, too. I could write to them tomorrow asking for a manual for my grandfather's 1960s-vintage Mark I and they would send me one. It would have a big disclaimer on the front cover that it does not describe a current product, but they would still send me one. 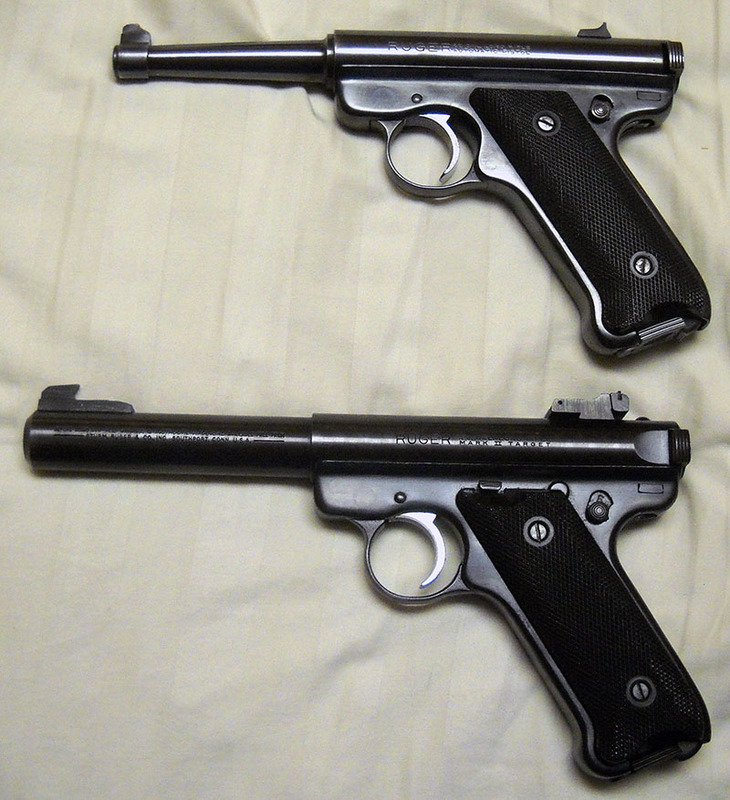 The Mark II was in production from 1982 until 2005, three years after William Ruger's death. 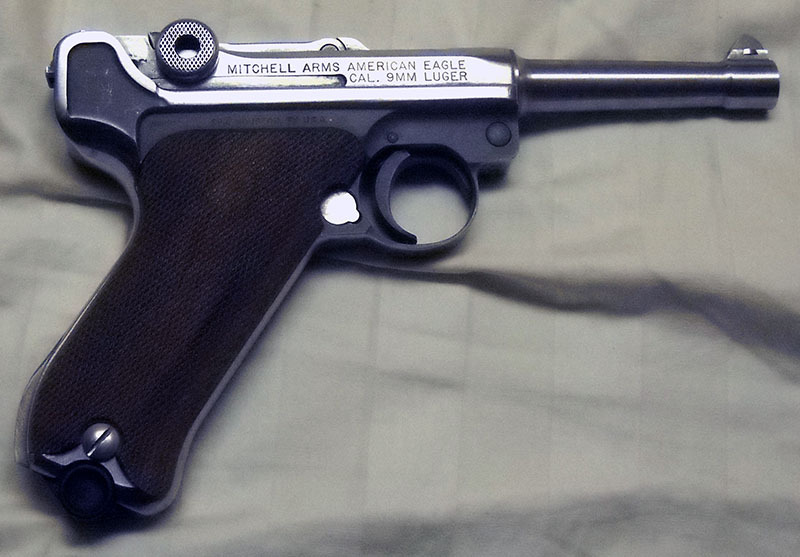 When the company replaced it with the Mark III, it became fairly obvious that what they had done in Ruger's absence was sit down with some lawyers and workshop ways of making the flagship product cost more to no useful purpose, and that's what they went with. Basically, they added two features that play well with people who don't know how guns work, one of which is unuseful and makes the gun slightly worse, the other of which is actively counterproductive. The first of the two is a magazine safety, which is a feature that had a brief vogue with military sidearms in the 1930s (you may recall that the Browning Hi-Power has one because the French Army demanded it, and then the French Army, uh, didn't buy Browning Hi-Powers, so thanks, guys), but which is really not practically useful in any measurable way. 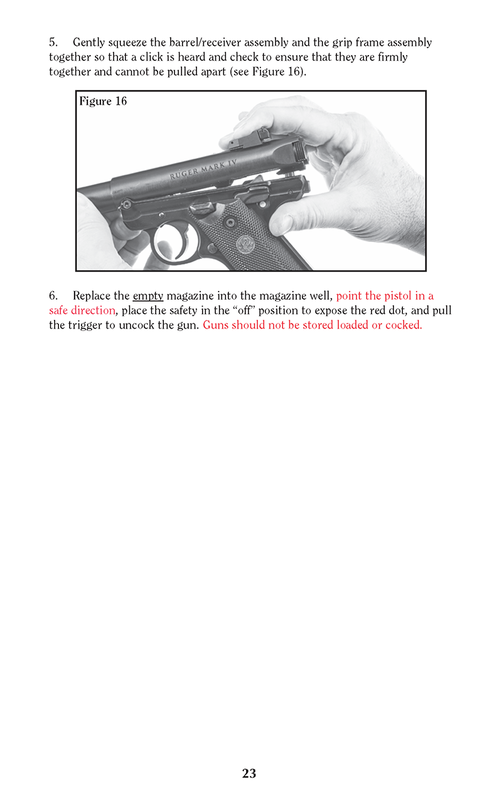 Basically, what a magazine safety does is prevent the pistol from being fired if it doesn't have a fully seated magazine in it. Which, well... why? Is it a safety feature? Not really, unless you're taking the view that your shooters are likely to be in less than full control of their weapons while loading and unloading, which is a pretty sketchy thing to assume. 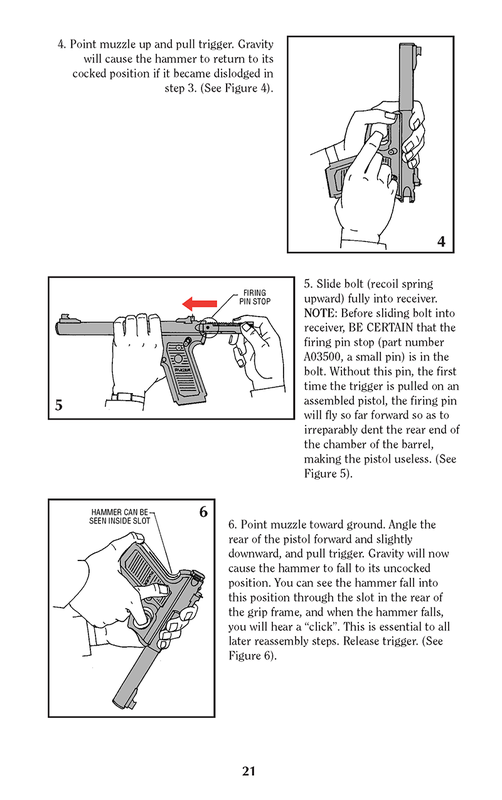 All it really does is make the trigger a bit worse, because now it has to do two things (actuate the mechanism that checks to see if there's a magazine, then fire the gun if there is one) instead of just one (fire the dang gun). The other really kind of gets my goat with an intensity out of all proportion to how consequential it is. They added a Loaded Chamber Indicator, which is to say, a little flag that pokes out if there's a round in the chamber to tell you there's a round in the chamber. Which seems reasonable enough on its face, except that anyone with even rudimentary firearms training shouldn't need it. If you have an LCI and pay any attention to it at all, that means you're relying on a mechanical gadget to tell you whether there's a round chambered instead of opening the damn action and looking, which is what you should always do if in doubt. So adding a widget to keep track of that for you, in my opinion, actually encourages neglect of safe practice. Nice work, guys! They also switched from a heel magazine release to a thumb button on the side, which seems frankly unnecessary and accomplishes little other than to make Mk III magazines incompatible with previous models and vice versa. Were people really clamoring for the ability to do hot tactical magazine swaps on their .22 rimfire target pistols? I'm skeptical. 1. "I Know Engineers, They Love to Change Things"
It's just come to my attention that, since I posted the above, Ruger have ceased producing the Mk III Standard after a mere 11 years—which sounds like a pretty good run until you reckon that the Mk I was in production for 32 years (from 1949 to 1981) and the Mk II for 23 (from 1982 to 2005)—and introduced the Mk IV in its place. Differences? 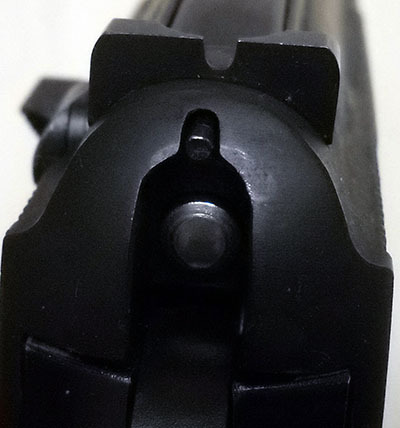 Well, the Mk IV still has the Mk III's useless lawyer features (the magazine safety and loaded chamber indicator), as well as the righty-only button magazine release (as opposed to the earlier marks' ambidextrous heel release). They've changed the safety switch from the old round button to a more modern/conventional "paddle" for the thumb, and made it ambidextrous (although the bumf on the product page reassuringly notes that they include a part to convert it back to left-side-only, I guess in case it offends anyone that the redesign caters even that much to the Unclean); magazines now drop out when released as opposed to needing to be pulled out, in keeping with Current Tactical Thinking (although anyone who finds himself in a tactical situation with a Ruger .22 target pistol has screwed something up big-time somewhere along the way). They've also made the bolt release lever bigger (and cheerfully tout it as Ergonomic, gagging noise here). Beyond that, it still has the Mk III's improved ejection port and bolt "ears", is still available with its normal grip profile or the 1911-style "22/45"-style frame, and still comes drilled and tapped for a scope mount. (This was standard on the Mk III models with adjustable sights; it looks like all Mk IVs have adjustable sights, so...) All in all, it doesn't really look that worth getting excited about. 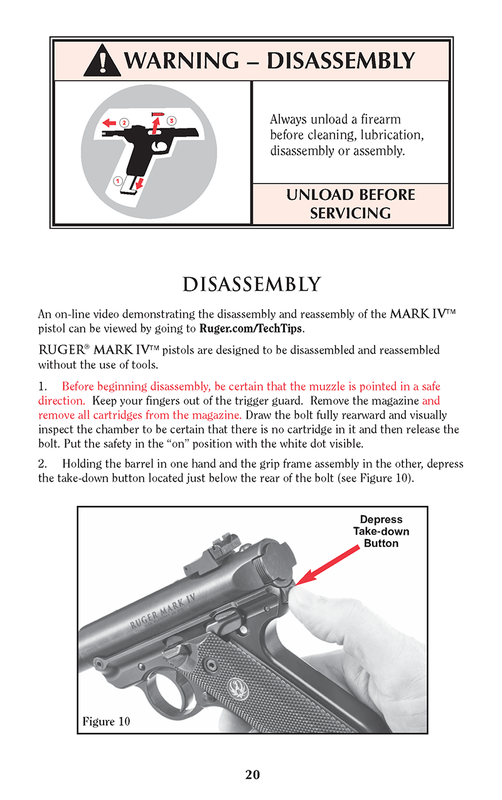 I think Ruger know it, too, because they've cannily made none of those adjustments the lede for the marketing materials. Instead, they've put in big print what is, I have to concede, the biggest thing they've ever changed about the Standard—bigger even than adding a proper bolt stop to the Mk II. They've gotten rid of the horrendous takedown procedure. The uninitiated may not know what I'm talking about here. Let me explain. 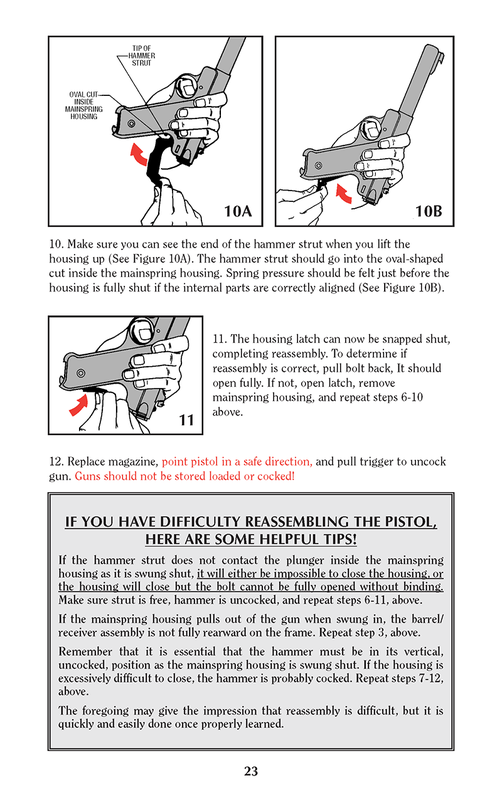 Actually, let me let Ruger's own manuals explain, if you don't mind doing a little scrolling. 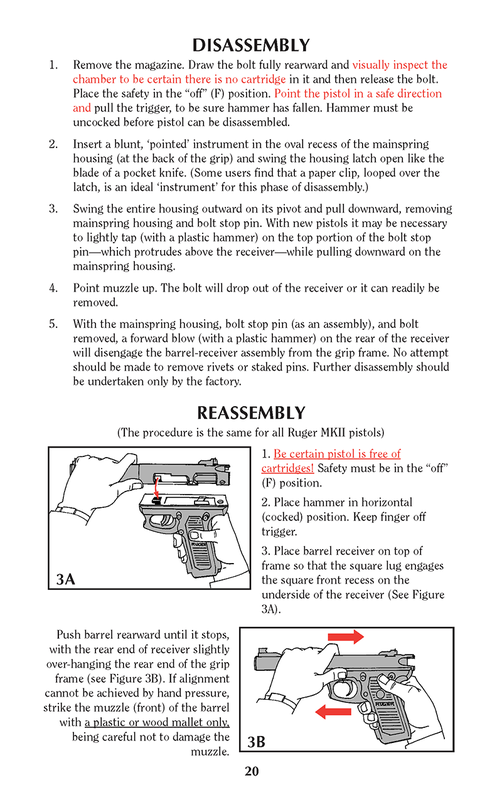 Here is the official procedure to disassemble and reassemble a Mk II pistol like the one I have, ripped direct from the owner's manual. How about that? The old Ruger Standard takedown is one of the most notorious I know of. It's complicated, it's annoying (particularly putting the damn thing back together again), and it not only requires tools, it needs one of those tools to be a hammer. I broke the tip off the mainspring lever of my original Mk II (not the one I have now) trying to get it apart, going by the book, and for the rest of the time I owned that gun there was a little rough edge on the backstrap to remind me that I'm a bit of a muppet. People sometimes take their Mk I–III pistols to gunsmiths just to be cleaned, either because they're afraid they'll break something, they can't figure it out, or they decided it's far too much of a hassle to do yourself if you have the wherewithal to pay someone else to do it for you. 5. "RE: I Know Engineers, They Love to Change Things"
I particularly like the "remove all cartridges from the magazine". the gun, to the point that it's marked in red for attention. 6. "RE: I Know Engineers, They Love to Change Things"
>I particularly like the "remove all cartridges from the magazine". >the gun, to the point that it's marked in red for attention. 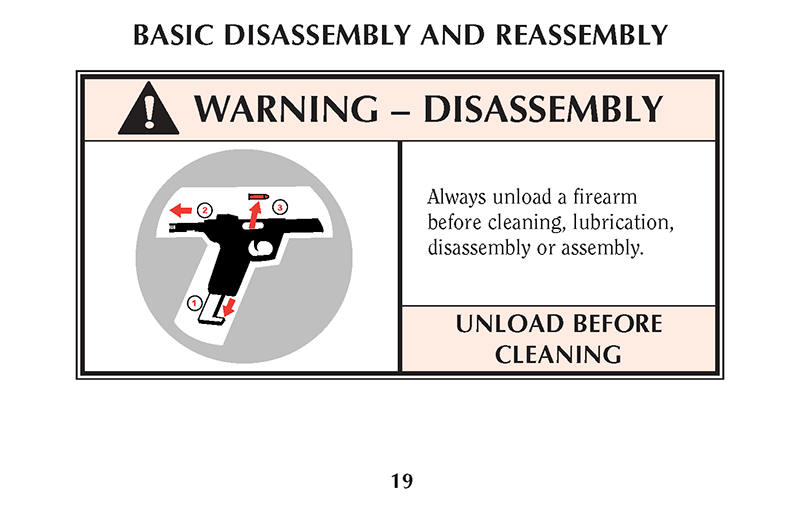 It's because of step 6 of the reassembly, where you have to put the magazine back in order to dry-fire the pistol (because the Mk IV has a magazine safety). Technically you're fine if you put a loaded magazine back and don't cycle the action again (you can see Ian do this with a Hi-Power in one of the match videos on InRangeTV, in the phase of the operations where the person with the timer tells him to clear the weapon and put it away), but it's not the sort of thing the people writing the docs are going to tell members of the public to get in the habit of doing. I find it mildly cringey that the instructions (repeatedly!) 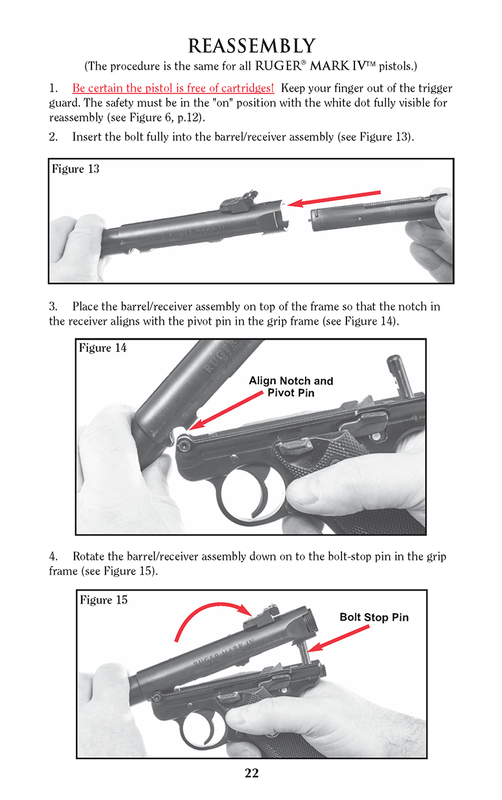 advise dry-firing a rimfire pistol—I would have thought the risk of peening the chamber rim would be worse than leaving it cocked—but I suppose one should trust that the manufacturer knows best about these things. 7. "RE: I Know Engineers, They Love to Change Things"
Well, yeah, but surely that should be a matter for the REassembly(as it indeed is, though interestingly NOT in red), and not the DISassembly? Sure, they're probably assuming you'd instantly reassemble with the same magazine, but it still looks silly-buggers to me. >one should trust that the manufacturer knows best about these things. Well, maybe they do, but I'm entirely with you on this one. 2. "RE: Gun of the Week: Ruger .22 automatics"
>round in the chamber to tell you there's a round in the chamber. >safe practice. Nice work, guys! Yeah, that does sound like a Lawyer Thing to do, especially for Lawyers That Have Never Actually Handled The Articles. "Oh, we can't actually rely on people to be properly trained to be instinctively safe and follow good, sound procedure when using the gun, so we need to add something so they don't need to remember to do it," while forgetting that such instinctual safety does need to be encouraged (if not mandated, but that's not a subject to get into here) with something that can kill someone by accident because someone wasn't. Especially since anyone with that same training will not only not trust that sort of helper (because it can and will fail, probably when it would actually be needed, which is why you train to manually check anyway), they may actively dislike it to the point they may not buy the gun just on that basis. Oh, and your reaction to it does say you can actually be trusted to follow the procedures, because you recognize the exact scope of the problem that they've introduced. 3. "RE: Gun of the Week: Ruger .22 automatics"
In limited fairness, it may well be less that and more "someone once sued a manufacturer for not including something to warn them it's loaded, so I guess we'd better account for that..."
Upon reflection, I can see a case for some LCIs. Some service pistols (the Walther P38 comes to mind) have tactile ones, so you can tell if your sidearm is ready to fire without having to look at it, which I guess could come in handy in some field situations. Marketing that kind of thing as a safety device, though, I think is a dangerously misleading thing to do. so that if the chamber is loaded, you can see a bit of the cartridge rim there. That's never not going to work unless you can't see into the ejection port for some reason, in which case you probably have bigger problems. I can't think of a situation a normal shooter might be in where pulling the slide back a little and looking inside wouldn't work just as well, though. Is your other hand unavailable? If so, then again, I would guess you have bigger problems than finding out if your Hi-Power is loaded. It's kind of a clever design trick, but I'm uncertain of its actual usefulness. Also, in no case I can think of can any of these systems, be they mechanical indicators or just clever ways of showing a little of the cartridge, distinguish between an unfired cartridge and a fired one. So if you happened across a random pistol on the ground with the indicator showing (and for some reason cared to pick it up instead of leaving it the hell alone), you'd still have to open it to find out for sure what's going on. I've tried to play devil's advocate with myself on this and come up with a pressing reason why you'd ever want one of these things, and I have never yet come up with a scenario that struck me as realistic in which it would actually be a useful feature. Certainly not to the extent that it would outweigh the false sense of security they may give the uninitiated. The only time I can ever remember my grandfather speaking sharply to me was when he was teaching me to shoot. I don't remember exactly when that was, but my grandparents were still running their hunting lodge up in the north woods. They sold the lodge when I was in junior high school, so I can't have been more than 11 or 12 at the time we were doing this. They had a giant back yard with a disused logging road leading out of it into the woods; at some point Gramp had taken a backhoe or something out there and raised an earthen berm a few hundred yards from the house, then built some rough benches to stand targets on at intervals between the house and the berm. I didn't think to ask at the time, but I'm guessing they were at whatever the standard range intervals were for the Army Reserve match shooting he used to do in the '50s and '60s. Anyway, back by the house at the firing line, he had an old picnic table with a couple of sandbags on it, for testing sight adjustments and the like. (I assume their customers used it to sight in their deer rifles as well.) We started there, shooting from the sandbags with a .22-caliber bolt-action rifle he had cut down to a sort of kiddie size for my aunt Dot when she was little. The rifle had no magazine, just loaded and fired one round at a time, but otherwise operated in much the same way as your average WWI infantry rifle, on a smaller scale. I don't remember now if it was on the first shot, but at some point early in this lesson, I fired, then left the rifle where it was and made to get up and go see where I'd hit the target. This was what I'd been instructed to do, except in my excitement I'd left out a step. I was pulled up short as much by the urgency in Gramp's voice as his actual words as he barked, "Open that bolt!" So yeah. I, uh, don't leave chambers in Uncertain Condition. 4. 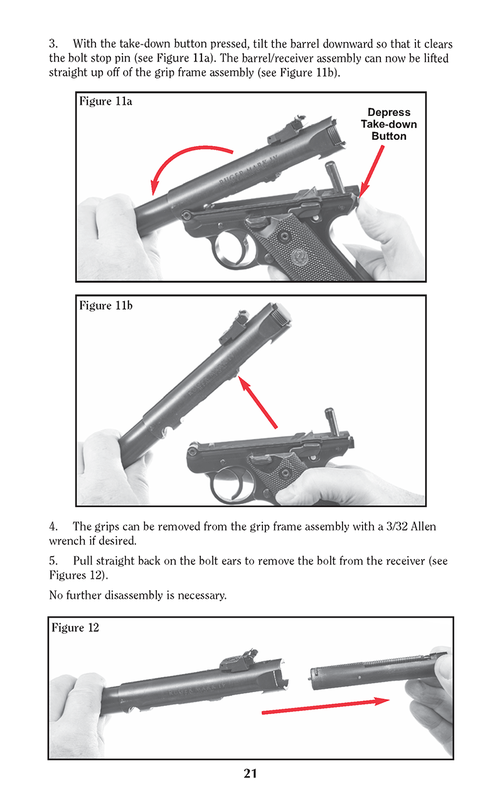 "RE: Gun of the Week: Ruger .22 automatics"
>dangerously misleading thing to do. Yeah, one use, and that being "hot situation, can't risk having to open my gun and check when I might need it." As you noted, everything else is iffy, at least in terms of that false sense of security. >as his actual words as he barked, "Open that bolt!" >So yeah. I, uh, don't leave chambers in Uncertain Condition. I've been trained to fire bolt action rifles, actually, back in my own Elder Days Story Time (at scout camp they had a firing range). I can see that being excellent training on the "don't leave chambers in uncertain conditions". You always go ahead and eject the empty after the shot, and otherwise you go ahead and unbolt to check once you're done. 8. "RE: Gun of the Week: Ruger .22 automatics"
>which I guess could come in handy in some field situations. It's that little pin above the hammer. In the first photo, the chamber is empty; in the second, there's a (fake) round loaded. My camera angle wasn't the best; when loaded, the indicator is slightly proud of the surface, so that you'd be able to feel it with a thumb. Got a pic of this, too. It's subtle, particularly as my dummy cartridges are nickel-plated rather than brass, but you can definitely see when there's one in there. Now, how much good that will do you in and of itself, that's another question.